Cut spaghetti squash in half lengthwise, use a spoon to remove the seeds and excess threads. Place spaghetti squash cut side down on a baking sheet and bake for 20-25 minutes. Make sure not to overcook!! Add your ground beef/turkey to a large bowl and add ½ tablespoon of parsley, basil, and thyme and a bit of salt and pepper. Combine. ******TIP FENNEL can add a whole new flavor to your meat so try using just turkey meat with Fennel and Sage you will be AMAZED at how much flavor the meat has. Make your ground beef into small bite-sized meatballs. Now place a large skillet under medium heat, add a little olive oil then small meatballs. Then add your can of tomato sauce, extra herbs, and salt and pepper. After meatballs have cooked for about 3-4 minutes, flip them and let them simmer in the sauce. 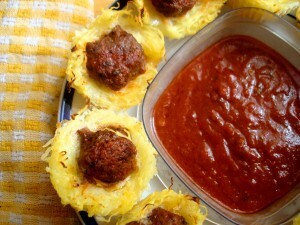 Spray your muffin pan then add your spaghetti squash threads pressing down in the middle of the cup for the meatball to sit. 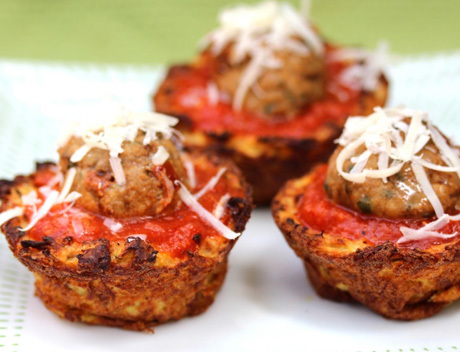 Now pour just a little bit of beaten egg white on top of each muffin, spaghetti squash and the meatball. Bake for 18-20 minutes or until egg is completely cooked through. Preheat oven to 375 degrees. Spray muffin tin with cooking spray. 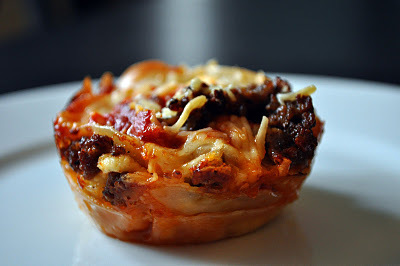 Start layering your lasagna cupcakes. Begin with a wonton wrapper and press it into the bottom of each muffin tin. Top with a little meat and marinara sauce. Then layer with another wonton wrapper and repeat the layers.